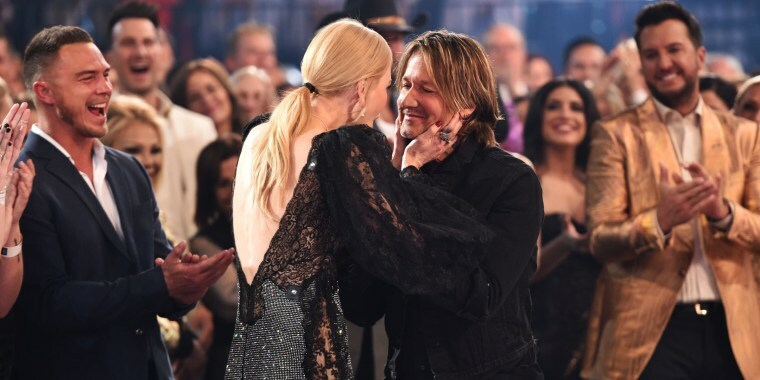 Keith Urban and Nicole Kidman are always such an adorable couple, and their date night at the Academy of Country Music Awards was no exception! Urban and Kidman attended the ACMs in Las Vegas on Sunday night and shared plenty of sweet, affectionate moments, starting on the red carpet. They also enjoyed this cozy moment during the show. And when Urban, 51, won the ACM Entertainer of the Year award, he gave his wife of 12 years a sweet shoutout, mentioning his cute nickname for her in the process. "Baby Girl, I love you so much," he said during his acceptance speech. He also shouted out to their daughters, Sunday Rose, 10, and Faith Margaret, 8. “Baby Girl, I love you and our girls, Sunday and Faith, who are at home watching right now,” he said. Kidman, 51, had plenty of supportive messages for her husband, too, posting on Instagram about how much she loves his song “Burden,” which he performed at the ACMs. In this thank-you video from after the ceremony, the actress gushed about her husband and how much country music has meant to both of them. And backstage after the awards show, she shared a cute, candid pic of her and her husband laughing and celebrating. At one point in the evening, the pair paused for a sweet smooch. It’s clear that Kidman is Urban’s No. 1 fan — and vice versa!